For many, home ownership is not only the American dream, but the ultimate dream. Of course, the reality of owning a home may not turn out to be a dream for everyone. There are a number of regrets that people may experience after purchasing a home. Some regrets are temporary and quickly fade away as you begin to make the home your own. Other regrets may linger and negatively affect your ability to enjoy your home. There are a number of reasons people may want to get out of their mortgage. The most common reason is financial hardship. Job loss, salary reductions, family illness or loss, and other unexpected circumstances can make the dream home mortgage suddenly feel like a waking nightmare. Moving to a new city can be another reason you may be looking to get out of your mortgage. This is especially true for people who cannot manage two mortgages at once and need to sell their old property. Whatever the reason may be, there are plenty of reasons to learn how to get out of a mortgage. Here are some of the options and why they may or may not be right for you. 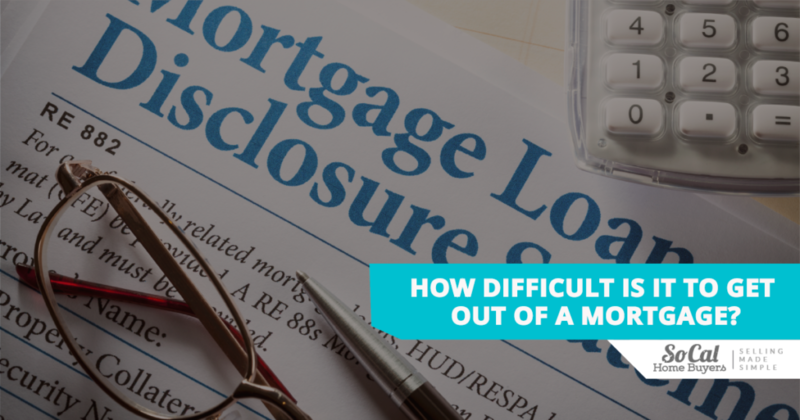 How Difficult is it to Get Out of a Mortgage? Banks do not make it easy to get out of your mortgage commitments. There are often penalties for breaking your mortgage early that can equal thousands of dollars. However, there are ways to get out from under a mortgage payment. When you break your mortgage early the bank will often assess a penalty for doing so. This is usually a calculation based on the amount of interest the bank will miss out on when you fail to complete your mortgage term. Each lender has different rules so it’s important to talk to your lender or consult your documents. With that said, there are situations where banks will forgive mortgage penalties or where paying the penalty is better than continuing with a mortgage agreement that you cannot manage. If you are experiencing financial hardship then you should always discuss your options with your lender. Forgiving mortgage payout penalties will often cost them a lot less than pursuing foreclosure. Walking away from your mortgage is also known as deed in lieu. 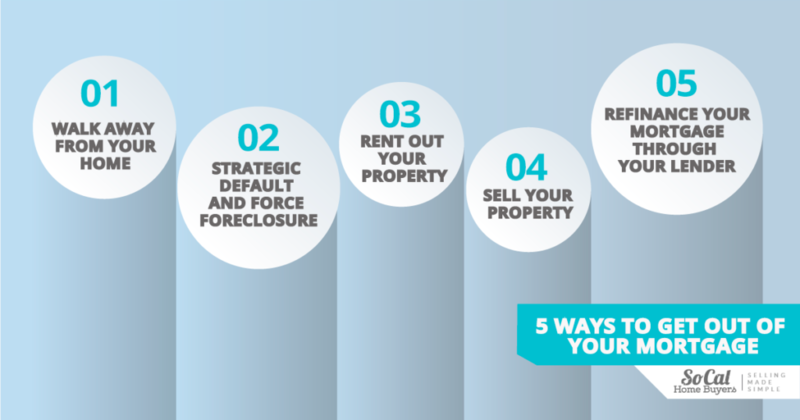 If you feel like you are about to break under the stress of your mortgage and you may be facing foreclosure – then this is a quick way to move the process along. Essentially you are handing over your keys and deed to your lender and allowing them to proceed with the sale of the property without having to go through the foreclosure process. While this may seem like the easy way out, the truth is that this can have long-lasting effects on your credit. Choosing to provide the deed to the lender and walk away from the mortgage is essentially the same thing as a foreclosure, and future lenders will take that into consideration. While you may not wish to purchase another home tomorrow, it’s impossible to say what your life situation may be like in 5 years. Deed in lieu should be one of the last options that you consider. There are other ways to get out of a mortgage that can have less of a long term effect on your life. However, when all options have been exhausted then you may want to consider this. Another option is to simply choose to default on the loan and force the bank to foreclose. Like the deed in lieu mentioned above, this is not an ideal option. Strategic default is simply choosing not to make payments even though you may have the means to make payments. It seems like a strange solution from the outside but there are some situations where people have utilized this option. Typically, people will choose to go with the strategic default route when their home is worth far less than what they owe. Selling the home would not earn enough to payout the mortgage balance outstanding. By choosing to stop payments on the loan, borrowers basically force the bank into the foreclosure process. The obvious downside to choosing this option is the negative effect it will have on your credit. Getting approved for any type of loan or credit product will become incredibly difficult for years to come. Some people also feel a sense of guilt when they stop paying on a loan that they willingly signed for. Most importantly, if you choose this option then you lose your home and any equity or future equity that you may have been building. Much like the deed in lieu solution, this should be one of your final considerations. If your mortgage payment has become unmanageable then you may be able to rent out your property and use the rental income to offset your mortgage costs. There are some major advantages to choosing to go this route but like other options on this list, renting your home is not without its downsides. While this option does not technically get you out of your mortgage it does help you manage the costs of home ownership. In addition, you continue to build equity in your property that you can tap into later when you sell or choose to borrow while using your home as security. The obvious downside to renting your home is that you are now a landlord. For many people this is simply not a title they wish to have next to their name. Being a landlord is a difficult job and comes with a host of additional responsibilities. If you are moving to a new city then being a landlord becomes even more difficult. In that case you may opt for the services of a property management company but they will demand a percentage of the rental income which could mean you are still on the hook for a portion of the mortgage. Before choosing to rent, be sure to review landlord and tenant laws in your city and state. You will also want to see what comparable properties are renting for to ensure that the amount you are hoping to get for renting your property is in line with reality. One of the most obvious options to get out from under your mortgage payments is to sell your property. There will often be a penalty for breaking your mortgage agreement early but that penalty may be a small price to pay for the peace of mind that you will get. There is the traditional method of selling your home which most people are familiar with. You work with a real estate agent, they market your home, homebuyers will make offers, and you choose to sell. In a hot market your home may move quickly. However, in most cases, the traditional home selling process takes a few months or longer. This is fine if you are in no rush – but if you have a deadline by which you need to sell your home then it may not be the right option. This is where real estate investors can step in and help you. 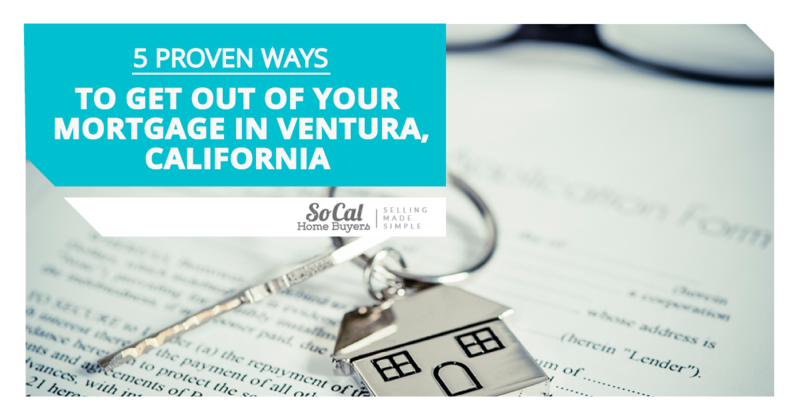 Companies like Southern California Homebuyers purchase investment properties with cash to help homeowners move on quickly from the mortgage that is looming over their head. If you are moving out of the city or facing foreclosure then their quick closing times may suit your needs. With cash in hand you can pay off the mortgage and, if there’s anything left, use those funds to get a fresh start or take care of other debts. Selling your property is also the best way to access the equity you have built in the home already. 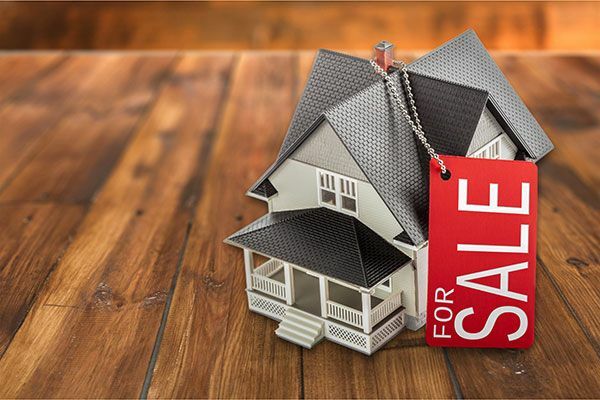 Investors can turn that equity into cash quickly while traditional homebuyers can do the same but with a longer timeline and more conditions that could delay closing. While this doesn’t necessarily make you mortgage-free – it does help make mortgage payments more manageable. Your ability to refinance will depend a lot on your credit and the amount of equity you have built in the home. If you have been missing payments for some time then your credit may make you ineligible for refinancing. However, it is always good to ask before writing off this option. Another good reason to consider refinancing is if you are looking to consolidate debt into one easy, low-interest payment. Reduce high-interest debt and simplify your payments by refinancing. Of course, this could increase your amortization schedule and change your long term plans. In addition, if you are not far into your mortgage then you may not have enough equity to allow you to refinance. Don’t let the stress of your mortgage make you feel like you have to accept your current situation. There are options available if you are wondering how to get out of a mortgage. If you have questions you can always consult a trusted expert for further advice to ensure you are making the right decision. Whether you want to remain in your home or move on and get a fresh start, there is a solution available for you.